Last week, we went to our county fair. 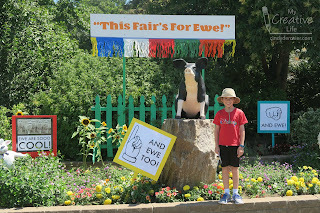 Because of camps, trips to Nebraska/Iowa, Nevada, and Oregon (which I'll share about soon), and other summertime fun, it was the only fair our family attended this year. That's a first for us. We usually attend at least two, and often three. We love the fair. Another first - Trevor entered items in only one county fair. Steve and I didn't enter at all. I did serve as a judge, but delivery dates (and restrictions on what I can enter) didn't work out for me to enter anything this year. As we were viewing Trevor's entries, it struck me how many of his prize-winning projects were inspired by Little Passports! In the picture below, you can see Trevor's Amish buggy art (Ohio), his bunny topiary (Rhode Island), his salt dough adobe (New Mexico), and his bolo tie (Arizona). You can also see the explorer ship that I taught to his 5th class. Five first place entries in a single display (there were others elsewhere), all because of our love of US history and geography. Pretty cool. Trevor should have another batch of crafts inspired by Little Passports to enter next year. Hopefully Steve and I will have some things to enter too. 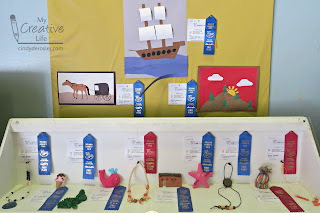 The fair is fun no matter what, but there's little that beats the excitement of finding your entry and seeing a ribbon. How very cool!!! Congrats Trevor!!!!!!!!! !